Corinthian columns are the most ornate, slender and sleek of the three Greek orders. They are distinguished by a decorative, bell-shaped capital with volutes, two rows of acanthus leaves and an elaborate cornice. In many instances, the column is fluted. 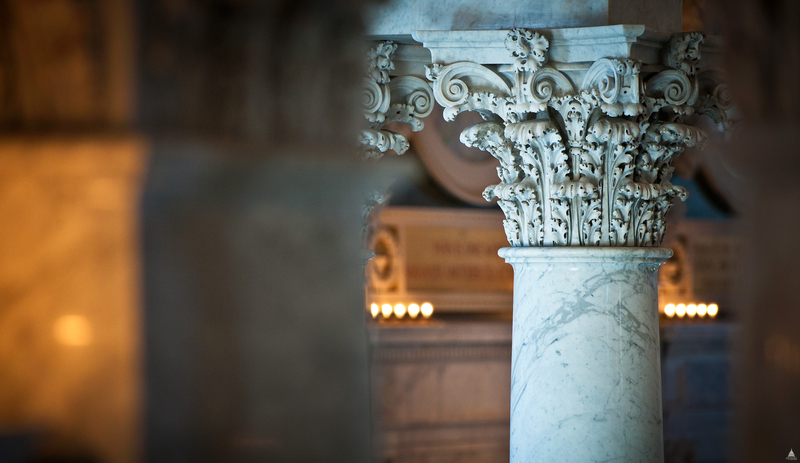 Columns in this style can be found inside and outside of the buildings on Capitol Hill, including the U.S. Capitol, the Supreme Court Building, the Russell Senate Office Building, the Cannon House Office Building and the Library of Congress. The exterior of the Capitol Building contains examples of a modified Corinthian column style, including the East Front center portico and the West Front. On the first floor of the Capitol’s House wing is the dramatic, high ceilinged Hall of Columns, which takes its name from the 28 fluted, white marble columns that line the corridor. The column capitals are a variation on the Corinthian order, incorporating not only classical acanthus leaves but also thistles and native American tobacco plants. Earlier uses of American vegetation in the building's capitals include Benjamin Henry Latrobe's corncob capitals in a first-floor vestibule and his tobacco-leaf capitals in the Small Senate Rotunda. The Supreme Court Building was designed in the classical Corinthian architectural style, selected to harmonize with the nearby congressional buildings. Its monumental entrance, facing the U.S. Capitol Building, contains a central temple-like pavilion fronted by a monumental portico with 16 Corinthian marble columns that support an elaborate entablature and pediment. In the Cannon House Office Building and Russell Senate Office Building, their identical rotundas contain 18 Corinthian columns that support an entablature and a coffered dome, and whose glazed oculus floods the rotunda with natural light.